Purpose: In this lab the interaction of various metals with salt solutions will be explored. Materials: Magnesium (Mg), Zinc (Zn), Iron (Fe), Copper (Cu), magnesium nitrate (Mg(NO 2)3), zinc chloride (ZnCl2), iron nitrate (Fe(NO3)2), copper chloride (CuCl2), silver nitrate (AgNO3), distilled water, reaction well plate. Safety: Wear goggles and gloves. Watch the copper in silver nitrate solution demonstration. 1. Place a piece of magnesium into the first 5 wells of the first row of the well plate. 2. Place a piece of zinc into the first 5 wells of the second row of the well plate. 3. Place a piece of iron into the first 5 wells of the third row of the well plate. 4. Place a piece of copper into the first 5 wells of the fourth row of the well plate. 5. Add magnesium sulfate solution to the wells in the first column. 6. Add zinc chloride solution to the wells in the second column. 7. Add iron nitrate solution to the wells in the third column. 8. Add copper chloride solution to the wells in the fourth column. 9. Add silver nitrate solution to the wells in the fifth column. In this lab, we tested various metals with various salt solutions to observe their reactions. The salt solutions had water with them, which some of the metals reacted with. The metals also reacted with the salt in the solution. 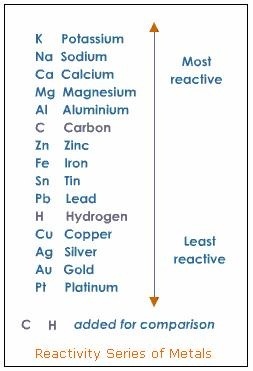 We found that the silver nitrate reacted with every metal above it in the reactivity series of metals chart found in the background section. When we added silver nitrate solution to the copper, the silver particles displaced the copper on the metal, and the silver nitrate became copper nitrate. The copper chloride also reacted very strongly with all of the metals. We also observed that the magnesium nitrate did not react at all with any of the metals. We know from previous experiments that magnesium is very reactive with both water and acid, while copper and silver are not reactive at all. From these observations, we can conclude that a salt solution made from a very reactive metal will not react with metals, while a salt solution made from a non-reactive metal will react with most metals.